Claying involves adding and incorporating clay-rich subsoil into water repellent topsoil to overcome the repellence. Adding clay-rich soil provides a long-term solution to soil water repellence, and also increases soil water holding capacity, reduces wind erosion risk, and may reduce frost risk. The high expense of effective claying can usually be recovered within a few seasons in the right environment. Claying is best-suited to medium to high rainfall environments with higher crop and pasture yield potential. Claying is the process of applying and incorporating clay-rich (30–50% clay) subsoil to the topsoil. This can be done by ripping, spading, delving or clay spreading, depending on depth to clay. Claying of water-repellent topsoil increases the soil surface area, dilutes the hydrophobic organic matter that causes the repellence, and increases soil wettability (especially the eveness of wetting). Effective claying can increase crop yield by 20–100% or more. Yield benefits can last for more than 30 years. potassium is marginal or deficient (<50 parts per million). Claying done wrong can cause yield reductions: poor incorporation of high rates of clay-rich subsoil are a particular concern. claying when other constraints can limit the size of any benefits. Deep-ripping and spading are cheaper than delving, and delving is cheaper than excavating and spreading clay. Choice of claying method depends on the depth to clay and the clay quality. Deep-ripping costs about $50 per hectare (ha) for sandplain soils, more on shallow heavy clay; may require incorporation by off-set disc or one-way plough (about $25/ha). Spading costs about $110–120/ha depending on the depth (usually 30–40cm). Deep-ripping and spading are often done together. Delving costs vary considerably with the depth to clay and the depth of delving into the clay: $125–200/ha. Excavation and spreading costs depend on the source of clay and the rate of spreading. Values in Table 1 are from trials in the West Midlands of Western Australia. Incorporation is always needed, and spading is preferred. The financial benefits from claying are very dependent on site conditions. Where there is a good case for each of the claying options, costs are often recovered in 2 to 7 years. See the farmer case studies in the GRDC publication Spread, delve, spade, invert: a best practice guide to the addition of clay to sandy soils for a range of costs and benefits. Claying can benefit sandy textured topsoils with less than 5% clay content that regularly have water repellence that affects crop and pasture growth. There are extensive areas on the sandplains of the south coast and the northern agricultural areas that have sands with about 1% clay and 1% soil organic carbon. Susceptible soils are pale deep sands, sandy duplex and sandy gravel soils. In the south-west agricultural region 3.3 million hectares of soil is considered to be at high risk of soil water repellence, with another 6.9 million hectares at moderate risk. Where water repellence is a problem for short periods, on very shallow duplex soils, or is only present as a problem in few seasons, other options are likely to be more cost-effective: wetting agents, delayed seeding, increased seeding rate, soil forming, soil inversion or mixing, change of land use to perennials. Do you have the right clay? For excavation and choosing the method of claying, use an auger or post-hole digger to check depth to clay and to collect clay samples. Contractors may have ground-penetrating radar, which is particularly useful for measuring depth of sand over contrasting layers such as clay or gravel. have non-toxic levels of boron or other toxic minerals. Estimate the clay content of subsoils by field hand texturing, or measure in laboratory soil tests. Slaking or dispersion can be tested by immersing subsoil aggregates in fresh water: if the aggregates slump, disintegrate or turn the water milky around the aggregate, then the clay is likely to be suitable for claying. Slaking or dispersing clays spread more easily throughout the soil; non-dispersive clays take longer to improve repellent soils. Clay-rich subsoils usually have high potassium content, which can significantly benefit crops. Alkaline clays can inhibit lupin growth in the first year of incorporation, but typically not beyond. to 5–7% clay in soil with more than 1% organic carbon. Typical rates of applied clay-rich subsoils are from a low of 150 tonnes per hectare (t/ha) to more than 250t/ha on sands. Gravelly sands require lower rates of clay application to achieve target reductions in water repellence – down to 50t/ha of subsoil with 30% clay – because the volume of sand can be down to 50% of the soil. Incorporating 100t/ha of subsoil that has a clay content of 30% into the top 10cm will increase the clay content of the topsoil by 3–4%. Clay content can be estimated using hand texturing to form a ribbon between the thumb and forefinger. A continuous unbroken soil ribbon of about 75mm indicates a clay content around 30%. mixing clay subsoil with upper horizons by spading, ripping or shallow delving: where there is less than 30cm of sand over clay – rotary spaders, some deep-rippers or shallow delving can be used to lift clay. On shallow sandy duplex soils where there is less than 30cm of sand over clay, use caution when lifting clay because the benefits may not be large and there is a risk of bringing up too much clay to the surface, resulting in a hard-setting surface that will restrict germination. In general, repellent shallow sandy duplex soils will wet up more quickly than deeper sands because they can more readily wet up from underneath as a result of slow infiltration into, and perching of water on, the clay B horizon. Sources of clay-rich subsoil need to be near the site where spreading clay – less than 1 kilometre in most cases – to reduce the high cost of transporting large volumes of clay-rich subsoil. If possible, use clay excavated from the same paddock where spreading clay. In Western Australia, clay subsoil is typically found below a layer of sand or gravel. Remove the overburden, then excavate the clay with rippers, carry graders, bulldozers or scrapers. Where the subsoil is in large aggregates, the clay may need to be broken up in the pit before spreading. Carry graders can be used to excavate the clay subsoil and to spread it in strips across the paddock. These strips are then 'smudged' with iron bars to spread the clay, and can also be worked with tynes to breakdown clods and spread the clay. This method can be used to spread high rates of subsoil (>150t/ha): spreading the subsoil in an even layer across the surface is critical. Heavy duty multispreaders can spread clay subsoil that has been fairly well broken up and does not have very large aggregates. 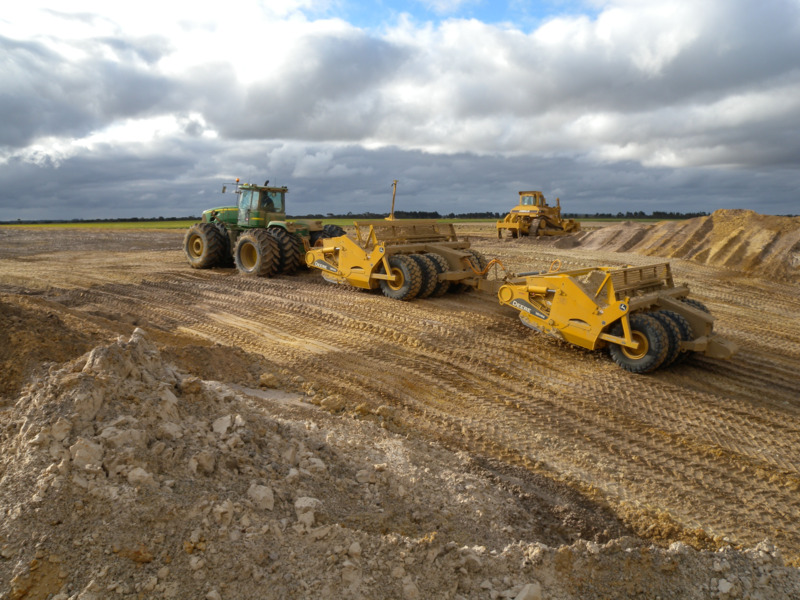 Multispreaders tend to spread the broken up subsoil fairly evenly, often with multiple passes and overlap required to get to the required rate: smudging is not needed. This method has been used to apply from 50t/ha up to 250t/ha of subsoil. Subsoil compaction is a risk from spreading. Where possible, avoid spreading when the subsoil is wet and more prone to compaction. Spreading with heavy graders in wet summers can lead to serious compaction in deep sands. Deep-ripping after claying can incorporate the clay and remove much of the compaction. Controlled traffic systems can maintain the benefit of ripping. Clay delving involves using large delving tynes that can penetrate into the subsoil clay layer and lift clay to the surface. Tynes can be up to 2.5m long, 10–20cm wide and are typically 80–100cm apart. Because of their large size and operating depth, delvers typically only have 2 tynes 1.8–2m apart, and are run with a half overlap to achieve a delving spacing of about 1m. They are pulled with tractors with 400 horsepower or more, and tracked machines are preferred because they have better traction. Typically, the tynes operate at an angle of 45 degrees. The optimal design is wider at the tip and becomes narrower towards the top, which helps the 'blocks' of clay subsoil, which may be quite sticky, come off the tynes as they reach the surface. Having a shallow concave shape or raised edges on the face of the tyne helps hold the clay on the tyne so that it can be lifted right up to the soil surface. It is cheaper than subsoil spreading: it uses the in situ clay-rich subsoil. Delvers have a deep-ripping effect creating loose pathways for rapid root growth. Sand falling into the clay B-horizon rip lines can increase rooting depth. Applying gypsum behind the delving tynes improves the structure and root access of sodic subsoils. Depth to clay and therefore rate of clay lifted varies across a paddock. In areas where insufficient clay is brought to the surface, there may be a deep-ripping benefit, but this will not be as long lasting as claying benefits. The soil can be left very soft, rough and difficult to traffic and maintain an even seeding depth. The incorporation process will help level the soil and rolling or working along controlled traffic lines can help with trafficability. It can be difficult to break up, spread and mix the large clods of clay brought to the surface. Rotary spaders effectively break up clods, otherwise smudge bars, cultivators, rollers, heavy harrows or prickle chains can be used. Achieving effective incorporation is critical for successful claying. Poorly incorporated clay can ultimately hinder crop establishment and limit crop productivity by increasing the risk of haying off. The type and extent of incorporation required depends on the amount of clay-rich subsoil that has been spread on the soil, the existing clay content of the topsoil and the depth of repellent topsoil. Traditionally, incorporation has been with offset discs and tyned implements, such as scarifiers, cultivators or heavy harrows. These are adequate for rates of clay less than 150t/ha and for shallow incorporation, but are inadequate for rates of subsoil application of 250t/ha or more and for deep incorporation. Rotary hoes and rotary spaders are more suited to incorporate higher rates of applied subsoil (Table 2). Rotary spaders can effectively incorporate clay to depths of 25–30cm. This depth of incorporation may be excessive for clay applied at lower rates, because the clay concentration at the surface may become too diluted and not fully effective at overcoming soil water repellence. Table 3 shows the effect on clay content of adding various rates of subsoil with 30% clay content to a water repellent sand with a bulk density of 1.45–1.60 tonnes per cubic metre (t/m3), a clay content of 1% and soil organic carbon of less than 1%. This is for a non-gravelly soil, and assumes that the subsoil is evenly mixed to the incorporation depth. We know that mixing evenly in the first year is not practical. The target clay content is at least 3%. See the 'see also' and 'external links' for videos and web pages, or contact the people listed below. DPIRD and Grains Research and Development Corporation support soil water repellence research through DAW00204 'Delivering agronomic strategies for water repellent soils in Western Australia'. GRDC - Spread, delve, spade, invert: a best practice guide to the addition of clay to sandy soils.